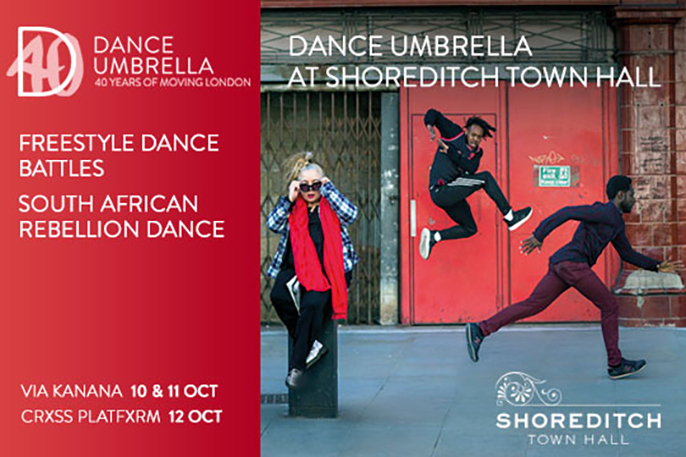 Dance Umbrella, London’s international dance festival, is hosting two companies brought to you by DU’s Freddie Opoku-Addaie – one hailing from South Africa and another much closer to home. South African dance company Via Katlehong started out in the townships in the East Rand, a notorious war zone in the 1980s. Since those early, uncertain days, they have flourished and are now one of Africa’s most successful companies. Their signature style is Pantsula, a township dance and this, combined with Gumboots (which originated with South African miners in the 50s) and Tap & Steps is what makes their show Via Kanana, choreographed by Gregory Maqoma, such a riot of energy, enthusiasm and protest. Stick around after the show for a DJ set with Rabbiah. CRXSS PLATFXRM is firmly rooted in the street culture of London but take inspiration from far and wide. For this year’s Dance Umbrella CRXSS PLATFXRM have curated an evening of live battles, fresh new sounds and conceptual performances, showcasing the influence that street fashion, film, art, music and underground culture have on London’s dance scene. Led by Ivan Blackstock, the evening promises a wave of fresh talent. Come and enjoy sculpture work by B-Boy and artist Izaak Brandt, DJ Kofi-M, music hacker Gonzy, and krump crew Rugged Estate. The freestyle dance battle will be presented collaboration with acclaimed B-Boy group Rain Crew.